(NationalSecurity.news) A burgeoning military-to-military relationship between the United States and India is emerging as China continues to build islands in the South China Sea and conduct aggressive patrolling using outsized sovereignty claims, and it is one that is likely to complicate Beijing’s plans for regional dominance. As reported by the War is Boring blog, while there is no formal alliance yet, one could be on the way. Also, what began as wariness by New Delhi has led, gradually, to new cooperation spurred on by mutual interests. 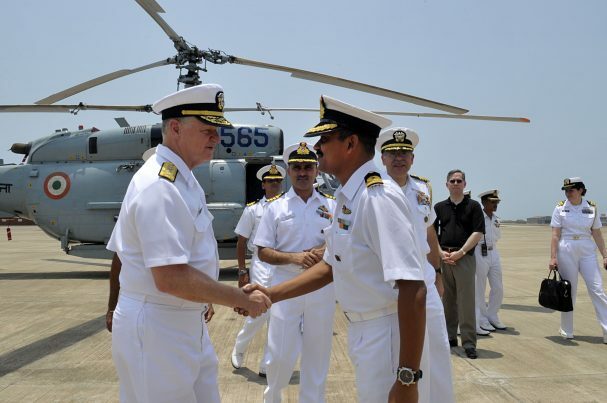 In recent days U.S. and Indian officials met for a “maritime security dialogue” in India’s capital. “The dialogue covered issues of mutual interest, including exchange of perspectives on maritime security development in the Asia-Pacific and Indian Ocean Region as well as prospects for further strengthening cooperation between India and the United States in this regard,” stated an Indian Ministry of External Affairs press release. Both nations are close to formalizing a historic military cooperation agreement that is broadly termed the “Logistics Support Agreement,” or LSA. It would allow the two militaries to use each other’s land, air and naval bases for resupply, repairs and other operations. American and Indian officials agreed to hold the summit during an April visit by U.S. Defense Secretary Ash Carter. Despite regular meetings and joint military training, the United States and India are not allies in any formal sense. India was officially unaligned in the Cold War but kept close relations with the Soviet Union — and the United States backed arch-rival Pakistan. Now, however, a slow but historic realignment is underway as U.S. foreign policy and military experts see China as the clear emerging threat in the region, as well as – though to a lesser extent, perhaps – Russia. As wariness of China is converging U.S. and Indian interests, at the same time Washington is growing less trustful of Pakistan, which deteriorated over the 15-year-long U.S. engagement in neighboring Afghanistan. Pakistan, meanwhile, is the world’s biggest buyer of Chinese weapons. Then, of course, there is the LSA which, if agreed to, would further enhance cooperation between the U.S. and Indian militaries, and to an unprecedented extent. In February U.S. Navy Adm. Harry Harris, head of Pacific Command, told Congress that the U.S. and India were negotiating the LSA, another agreement called the CISMOA that would allow secure communications when both militaries operate together, and a third pact that pertains to the exchange of topographical, nautical and aeronautical data. “We have not gotten to the point of signing them with India, but I think we’re close,” Harris told the U.S. House Armed Services Committee.